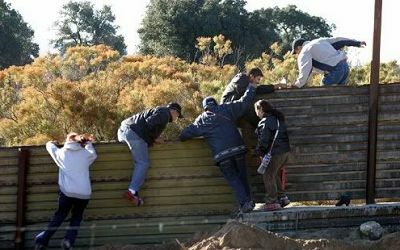 I have also observed that where people stand on legal and illegal immigration varies due to a variety of factors, except for politicians and people who are active politically. The people in the last groups, politicians and politically active people, usually fall into one (sometimes two) of the following three categories: ideological, self interest, or what they believe the majority of the American people want. This is of course another huge topic for discussion in itself and will be the subject of one of my post in the near future. There are hundreds of thousands of people “legally”(?) admitted to the US each year (over 500,000 on student visa’s alone). I had no idea there were so many different types of visas. There is very little, if any, background checking done and little to no follow up to see if they are actually doing what they were admitted to the U.S. to do, or if they went back home when their visa expired. Examples are student visas where they are registered to attend classes at “approved” schools. Some of these schools do not have instructors, class rooms, on-line classes or staff. Only a small number of these schools have been busted and those were the result of tips from concerned citizens. Obviously these “students” are doing something else, like taking jobs from U.S. citizens. There are literally millions of people here illegally and very little is being done to follow up by DHS or any other agency. In fact people who overstayed their visa are a large percentage of the 11 to 12 million people that the politicians admit are here illegally. It is also important to note that some people claim that the number of illegals in the US is significantly larger than 11 to 12 million (“!ADIOS, AMERICA!” by Ann Coulter). This is part of the reason that our real unemployment and underemployment rate is probably somewhere around 20 plus percent. It is simple math. You need a net of about two and a half million new jobs per year in the U.S. for the unemployment rate to just stay the same due to the number of people who turn 18 in the U.S. each year (2010 US census data). The math simply does not add up when you add this to the number of immigrants the Government allows to enter the US each year on visas. I actually know a lot of people who have been a victim of this “outsourcing”. One has worked in administration/data processing for the same company for 42 years. It has merged and been bought out a number of times over these years but she still worked at the same location. She turned 60 in January. Her department is being outsourced this month (March 2016). They were told about this in mid-December. She is also a cancer survivor. There is no chance she will get another job other than something like part time work at Walmart. My former employer did the same thing last August. They “outsourced” jobs and functions, laid off hundreds of people nationally and shut down and liquidated facilities. The majority of these people were career employees who had worked for this company their entire adult life. They got a small exit package and were eligible for a maximum of 14 weeks of unemployment only if they stayed through the outsourcing and facility liquidations. The expansion of one visas program is beneficial for the US. 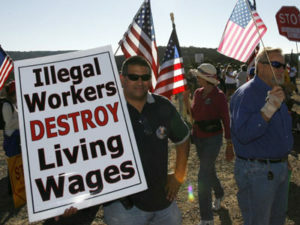 It is the one used to allow unskilled, seasonal migrant workers into the US .They pick the fruits and vegetables and do other manual labor jobs.There is a shortage of people who will, or are physically able to do this back breaking work and live in the conditions that they do as they move from job to job. Last year there was a Fox News special report featuring farmers in Southern California where crops were rotting in the fields because they did not have enough people to harvest them. About that time The Governor quietly lifted California enforcement of state and federal laws regarding these people. Have you noticed the price of red and yellow bell peppers, orange juice, etc. in recent years? This is the one visa program with the least amount of fraud because there is less money there to attract corruption. Unfortunately the companies and special interest groups are using the shortage of workers in this group to attempt to justify the need for bigger numbers in the programs they want. There is not really a reasonable comparison here but they are using it successfully. EB-5 (yes the 5 means there are 5 versions of just this one). It allows wealthy foreigners who are willing to “invest $500,000 to $1,000,000 in a new business in the US, or expand an established business to create or maintain jobs” get to come to the US, and bring their families with them with a pathway to citizenship. You can see from the language how easily this one can be manipulated. One example is Terry McAuliffe (yes that one.) The Clinton insider who became the Governor of Virginia after the DNC and the Clintons came in and literally bought the election for him when he was running way behind. He sought and got some of these EB5 investors to invest in the electric car company where he was a partner (Clintons and huge amounts of illegal foreign money again). The company failed, No accounting for the money, no follow up on the jobs created or maintained.